Pete Morgan ranking cows for drying off with equity partners, Pete and Jenny Sinclair. In their early twenties, Pete Morgan and his wife Ann, decided to go farming. They could see the life, challenges and rewards they were looking for but wanted to run a farming business based on the best scientific principles. Both have science backgrounds as Pete studied Ag Science at Massey, and Ann is a qualified veterinarian. 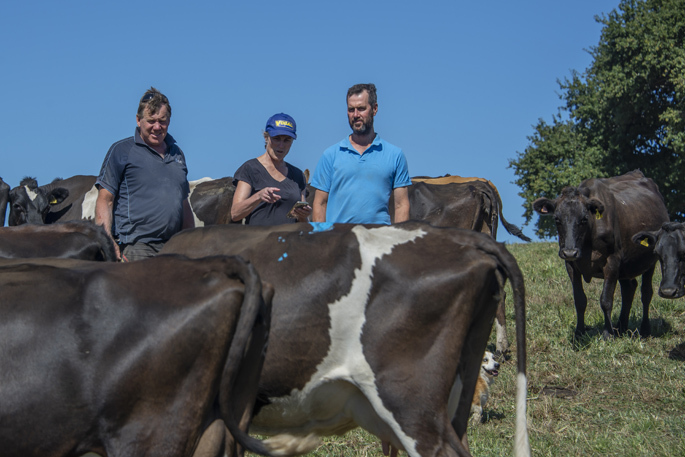 After sharemilking in the King Country, the couple bought Ann’s Pokuru 125ha family farm, Morlands Farm, in 1999 and have since expanded to become the 265ha property they run today. In 2017 the couple entered into an equity partnership with friends Pete and Jenny Sinclair. The partnership uses the System 2 model – less than five per cent bought feed – which suits their skills, interests and lifestyle. The strong focus on pasture requires less time and effort to physically manage compared with higher input systems. Pete also warns however, that you also must be prepared to take the good with the bad when relying primarily on pasture. They’ve planted different AR37 perennial ryes and mixed in cocksfoot on some of the steeper country. The rye performs well until conditions dry out and then the cocksfoot sees the rest of the season through, ensuring there is some grass available. The farm has contingency plans with an order of responses carefully laid out to follow setting up for summer to react smartly. First, slow the round as spring surplus period ends and further as autumn feed allows. Second, monitor APC and intakes carefully to balance feed used with demands on the cows. Third, time once-a-day milking to retain production and reduce animal and human stresses. Fourth, start de-stocking as early as possible to protect remaining cows. Fifth, use forage crops efficiently as they are ready. Sixth, start late-season feed budget in January to plan the remaining season and update weekly. Seventh, use on-farm supplement stores when you’re sure they’ll be utilised well, minimising pasture substitution. Ensure the diet is balanced for the stock needs. Eighth, dry off cows or buy in feed according to feed budget and supplementary cost/benefit analysis. All plans and actions for the second half of the season are aimed at setting up the next season, that is achieving their Average Pasture Cover, Body Condition Score and feed reserve goals. When Coast & Country News visited, there was still some pasture growing thanks to the cocksfoot, and you only had to look at the paddocks to see the difference between recently -grazed and the slight green of the rested ones. The chicory paddocks were a vibrant acid green next to them. The silage pits were low, even with the buffer left from the previous year. “Right now, we are at number seven on the list,” says Pete. That decision will depend on BCS, predicted growth, current milk payout compared to the cost and availability of buying in feed. “We’ve made the call to use all remaining grass silage with maize during the next three weeks and continue milking at this stage,” said Pete in mid-March. “It’s really important that changes in the feed budget, forecasted production and costs are regularly used to update the financial budgets so we can be aware of the impact on income. For them, they’re using the most reliable and economic system. They grow and utilise the best quality pasture, and if they get that right, the rest will follow. Good planning is the backbone of the system. It gives you a great framework and helps minimise risk.